During the late 1980s and early 1990s, VHF and UHF spotting networks began moving from voice repeaters to VHF and UHF PacketClusters that exploited personal computers. In the mid 1990s, the Internet's Telnet protocol was used to construct a network of DXClusters, making it easy for any DXer to monitor spots -- reports of active DX stations -- on his or her Internet-connect computer. Identifying a currently active DX station as being needed for one or more awards the DXer is pursuing provides the opportunity to make a QSO that will advance award progress. what DX stations are currently active, on what bands, and in what modes? from what locations is each active DX station being reported? which active DX stations are needed needed for any of the awards the DXer is pursuing? what bands are currently open from the DXer's QTH, and to what continents? what bands have been open from the DXer's QTH at what times in the past, and to what continents? up to four telnet-accessible DXClusters. By using spots to track active DX stations, the DXer can see current band openings from his or her QTH, observe propagation patterns over time, and discover the operating habits of needed DX stations. If you are using DXKeeper to log QSOs and track progress against DXing awards, SpotCollector will use font color to identify active DX stations that are needed for one or more of the DXCC, IOTA, Leaderboard, Marathon, VUCC, WAS, WAZ, or WPX awards you're pursuing, as specified in your DXing objectives; when you work or confirm a needed DX station, SpotCollector automatically updates the information it displays to reflect the new status. On installation, SpotCollector comes preconfigured with connection information for several spot sources, but you must specify a username and password before a spot source can be enabled to supply spots. You can also select a different set of spot sources more appropriate to you needs. While all spot sources eventually receive all spots, spots sources closer to a DX station can notify you of that DX station's presence as much as 60 seconds earlier than spot sources located further away. DXers should consider selecting spot sources in Asia, Europe, North America, and South America. DX spots specify a callsign, frequency, date, time, and (optionally) up to 29 characters of "notes". Given the absence of an explicit mode designator, SpotCollector first checks an incoming spot's notes for the presence of a mode designator; if one is present, the Spot Database Entry created will specify the mode designated in the spot notes. If no mode designator is specified in the spot's notes, then SpotCollector queries the specified Sub-band Definition file for an entry whose frequency range encompasses the incoming spot's frequency; if an entry is found, the mode specified in that entry is used in Spot Database Entry created from the spot. After initial installation, SpotCollector references a Sub-band Definition file named BandModes.txt that defines sub-bands from 160m to 12cm for CW, LSB, USB, FM, and RTTY. You can modify or extend the entries in this file to reflect local usage and to include sub-bands for additional digital modes. Spot Database Entries are automatically constructed and updated as incoming DX spots arrive at from spot sources like DX Central. Unless the bands are dead, you should already see a few entries. Armed with this knowledge, you can focus your listening on times and frequencies more likely to be productive. You can sort Spot Database Entries, and you can filter the Spot Database Display to show only entries matching a particular callsign, DXCC entity, band, mode, continent, origin (location of the stations that spotted the DX) or combinations thereof. You can direct Commander to display a Bandspread Window showing active DX Stations with this color-coding. 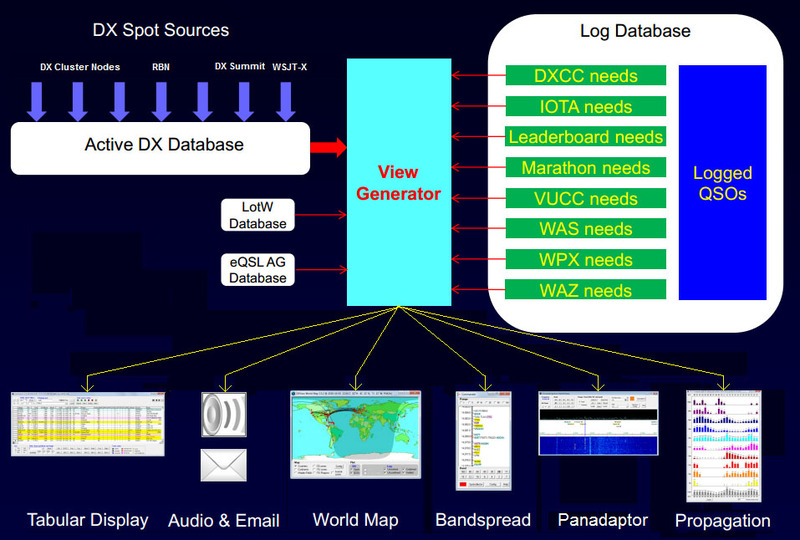 There are several ways to determine why a Spot Database Entry's DX Station is needed. 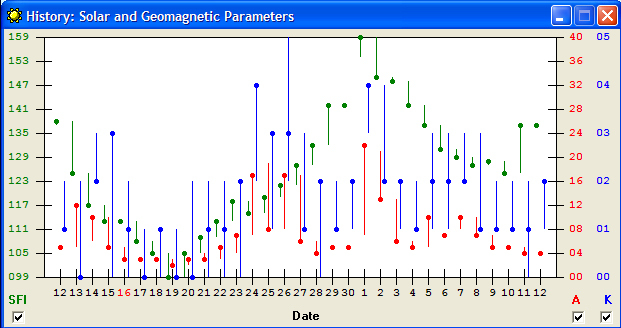 There are several ways to determine from where an Active DX station is being spotted. SpotCollector can use reports of active DX stations by stations near your QTH to display activity on each band by time of day, and to display activity on each band by continent. You can examine each of the three indices individually by checking or unchecking the SFI, A, and K boxes in the lower corners of the display. Given the sun's 27-day rotation period, this information can also be helpful in predicting future HF propagation. SpotCollector automatically conveys this information to PropView. click the Config button to open SpotCollector's Configuration window and select the Spot Sources tab. No entries in your Spot Database display? Can't connect to DX Summit via IRC? SpotCollector stealing mouse cursor focus?